​from various sources in order of date published. 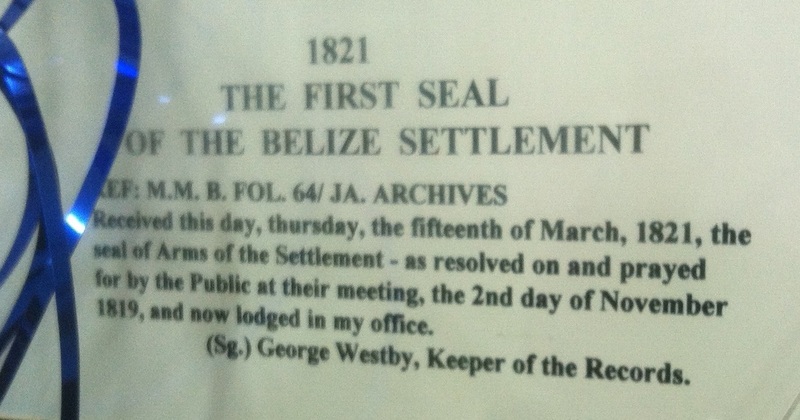 Adopted by resolution of public meeting on Nov 2, 1819 and received by the Keeper of Records on march 15, 1821. 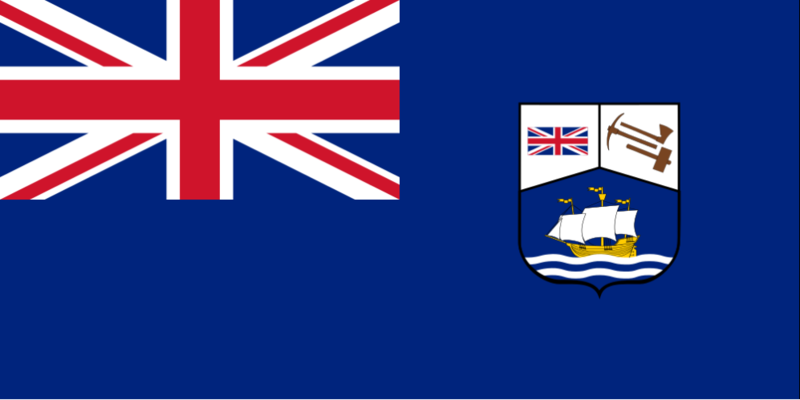 Note: The Union Jack is displayed in the horizontal position, in other versions hereafter, it is displayed vertically. 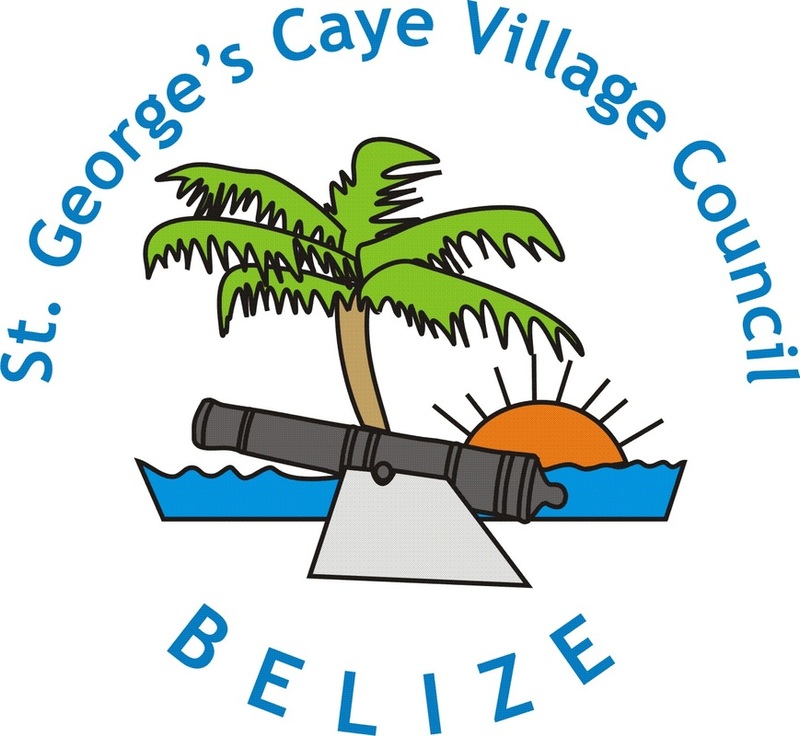 Note: No description of the components of the Coat of Arms is made in the Gazette. This description follows the form of others from later time periods. 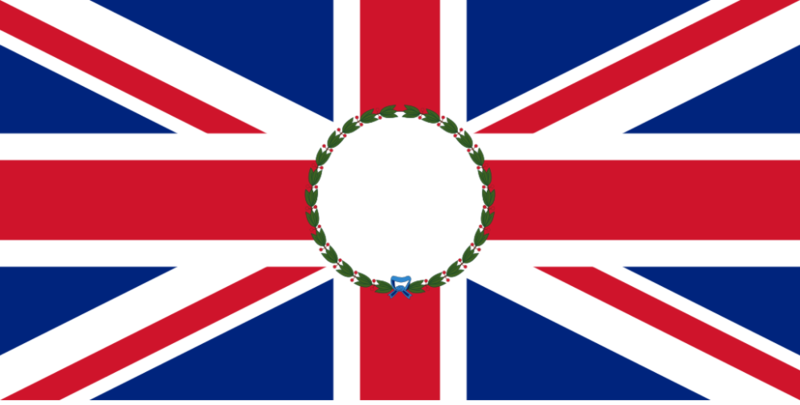 In this version the shape of the shield has changed and the Union Jack is hung vertically. The shield of the Coat of Arms is divided into three sections by a vertical line and an inverted V. The base section represents a ship in full sail on waves of the sea representing the mode of transport of exports. 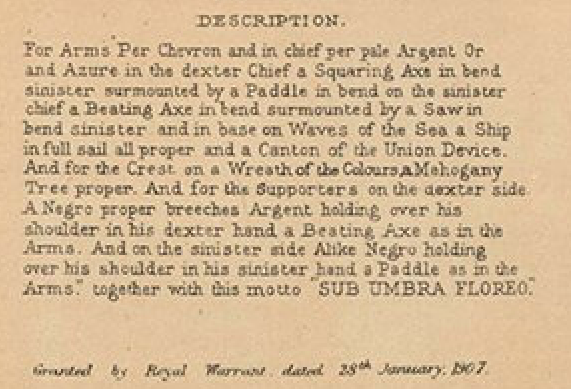 The upper left sections features the British Union Jack and the upper right tools of the logging industry which are difficult to see but could be the four tools used on later flags including a squaring axe, paddle, beating axe and saw. Supporting the shield are two woodcutters, the one on the left holding a squaring axe over his shoulder in his left hand, and the one on the right holding a paddle over his shoulder in his left hand. 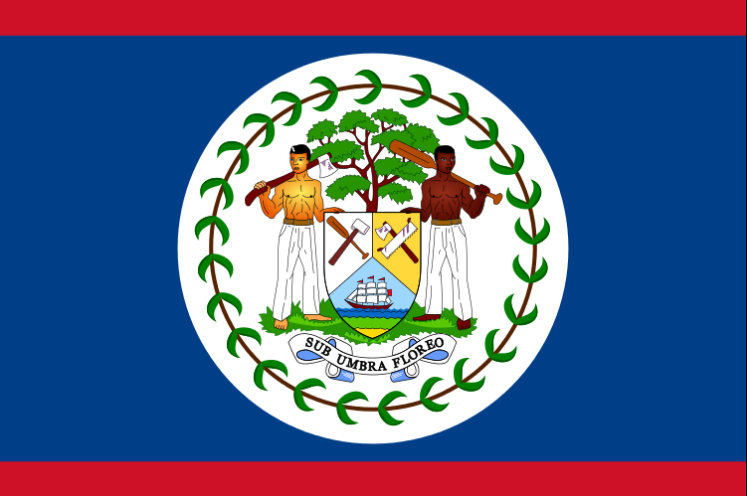 Above the shield rises a mahogany tree with two sections of leaves. Below the shield is the motto scroll "Sub Umbra Florero" latin meaning, "Under the shade I flourish." The loggers stand on a base of solid base of wood, possibly the wooden base stood on by woodcutters as they felled the large trees above the roots. 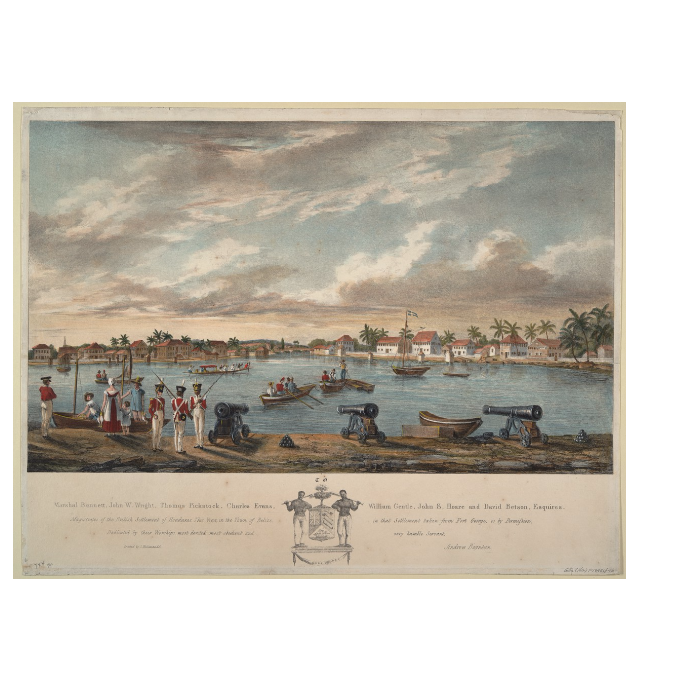 View in the town of Belize...taken from Fort George...view across harbor from fort with cannon, showing in foreground soldiers of 1st West India Regiment. Note: The initials T O appear above the mahogany tree. The motto Sub Ubra Floreo is misspelled and should read Sub Umbra Floreo. 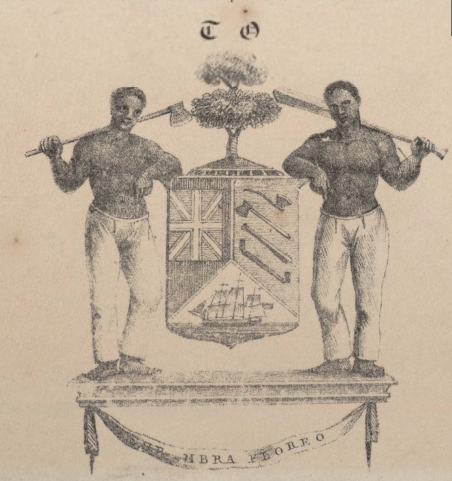 Note: In this version two of the logging tools are placed behind the flag and wooden stand is removed and the woodcutters stand on the banner. As displayed in Life Magazine courtesy Ambergris Today. The shield of the Coat of Arms is divided into three sections by a vertical line and an inverted V. The base section represents a ship in full sail on waves of the sea. The two upper sections show tools of the timber industry in Belize: a saw and a squaring axe in the right section and a paddle and a beating axe in the left section. Supporting the shield are two woodcutters, the one on the right holding a paddle over his shoulder in his left hand, and the one on the left holding a squaring axe over his shoulder in his right hand. 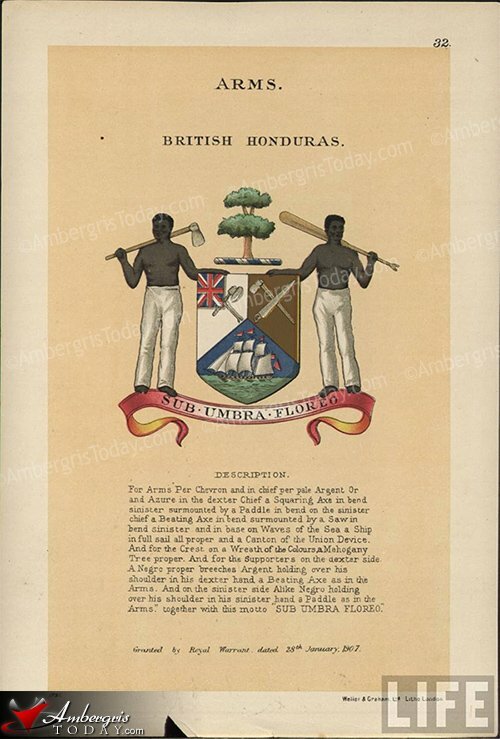 Above the shield rises a mahogany tree. 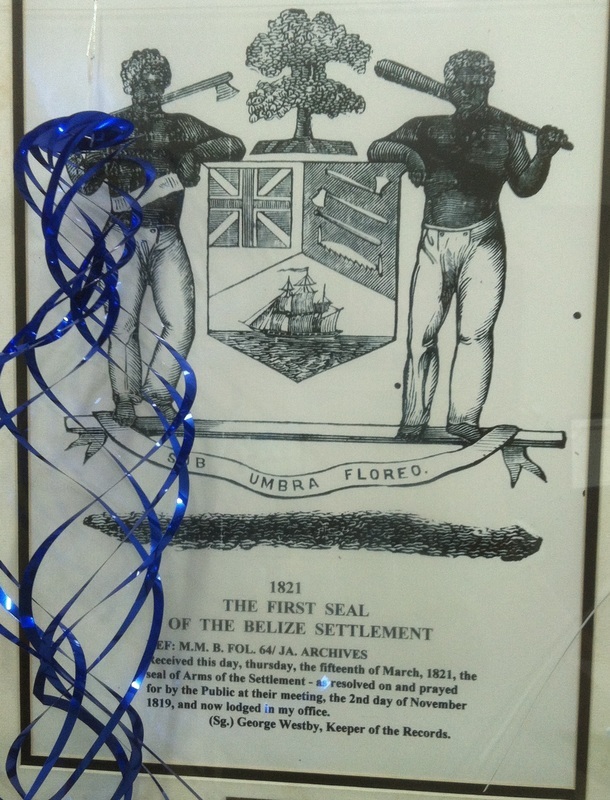 Below the shield is the motto scroll "Sub Umbra Florero" latin meaning, "Under the shade I flourish." A wreath of 50 leaves encircles the Coat of Arms. The Coat of Arms consists of a shield that is divided into three sections. At the base, a ship is in full sail, which represents the mode of our trading. At the two upper sections are tools once used in the timber industry in Belize. Those include a paddle and a beating axe on the left and on the right – a saw and a squaring axe. Supporting the shield are two woodcutters dressed only in long white trousers and standing on grass. The Mestizo man on the left is holding another squaring axe over his right shoulder, while the black man on the right is holding a paddle over his left shoulder. 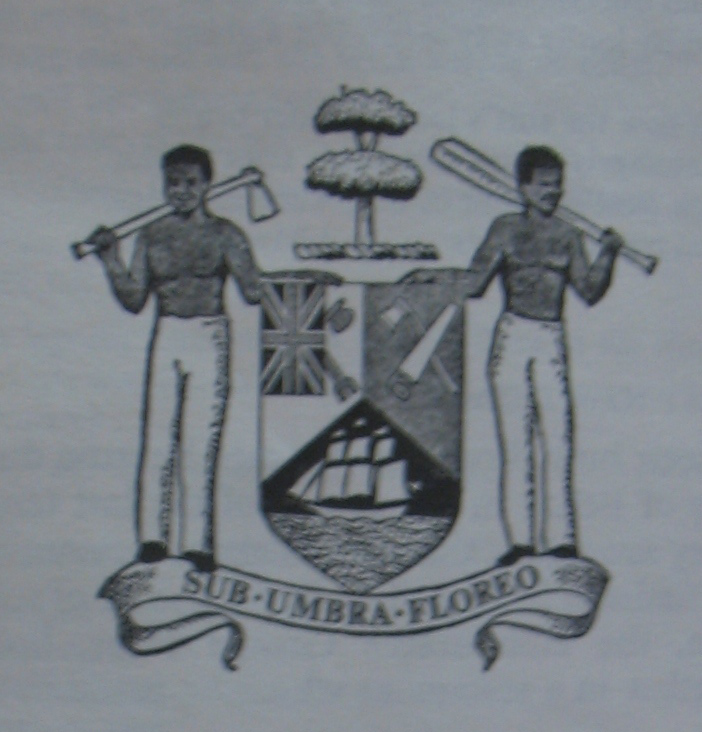 Above the shield rises a mahogany tree and below is the motto scroll “Sub Umbra Floreo”, which when translated from Latin reads “Under the Shade I Flourish”. A wreath of fifty leaves locally called “Scorn the Earth” encircles the Coat of Arms. The fifty leaves signify the year 1950, when the first flag was presented. 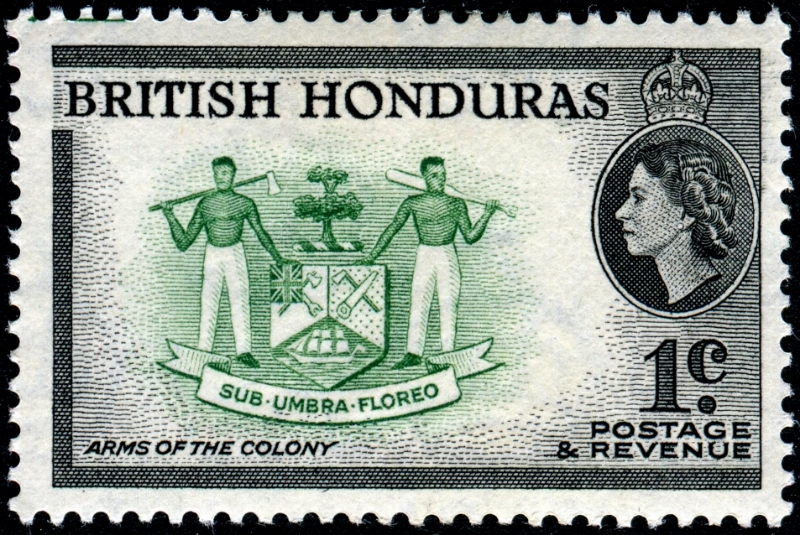 Engraved and printed by Waterlow & Sons, Ltd., and issued for use in British Honduras on September 1, 1953, Scott No. 144.